Our kids had winter break until Jan 9, and we took a much-needed break too. We often haven’t been able to pay them the attention they deserve while starting a business, so it was great to focus on family time. But now we’re back and ready to spread Food Allergy Awareness in 2017! A new year is typically a time for self-reflection, and I’ve been doing a bit of that over break. On several occasions, I’ve thought back on the reasons I began blogging about food allergies–mainly, that many of the attitudes I’ve seen on the subject are vastly different from my own. This isn’t necessarily surprising–after all, the majority of people talking about food allergies online are parents who entered the world of food allergies when their children introduced them to it in grand and often terrifying fashion. Their fear (and sometimes paranoia) is understandable, but as someone who has known no life but an allergic one, I also know that maintaining that constant level of fear is not healthy. I strive to share both personal experiences and advice to the effect that food allergies don’t have to be paralyzing. This community has been good for me, too. Even having grown up with food allergies, I haven’t always been patient with other people navigating them. During my early adulthood, I tended to judge people who weren’t as comfortable with allergies as I was. It took becoming a food allergy parent, sending my allergic kids to school, AND putting myself into the shoes of the people I met online to help me see the perspective of people who have not been living this life for as long as I have. I still find attitudes that bother me though, and not just levels of fear that I attempt to soothe. I really get annoyed when I see people publicly getting self-righteous and aggressive about how to include their child, because that sort of behavior sets us all back. Before Christmas, I read an account from a fellow food allergy parent who was having a difficult time with classroom celebrations. Her frustration was valid, but in the comments she actually stated that she didn’t care about other kids’ feelings so long as her child was included. I chose not to enter into that discussion, but in my head I was wondering “how do I get her to understand that this is a big part of her problem?” If she’s always had a combative attitude towards the accommodations she requests for her son, then of course people are going to push back. It’s in our nature to defend ourselves when attacked, even if the attacks are purely cognitive. Therefore, if we get aggressive with others, they’re unlikely to see things our way. People may even resist accommodations that they would otherwise agree are reasonable, because they feel the instinctive need to fight back. None of us exists in a vacuum. The food allergy interactions we have with others are party defined by their preexisting attitudes towards allergies, but they are also defined by the way we approach the subject. So often, the people I see complaining about the worst attitudes from others are the people who demonstrate the most aggressive approach to their child’s care. It’s hard to not get emotional when encountering ignorance and resistance in others, especially when our kids’ safety is at stake–but so often that just makes us do things that turn other people off and make the situation worse. 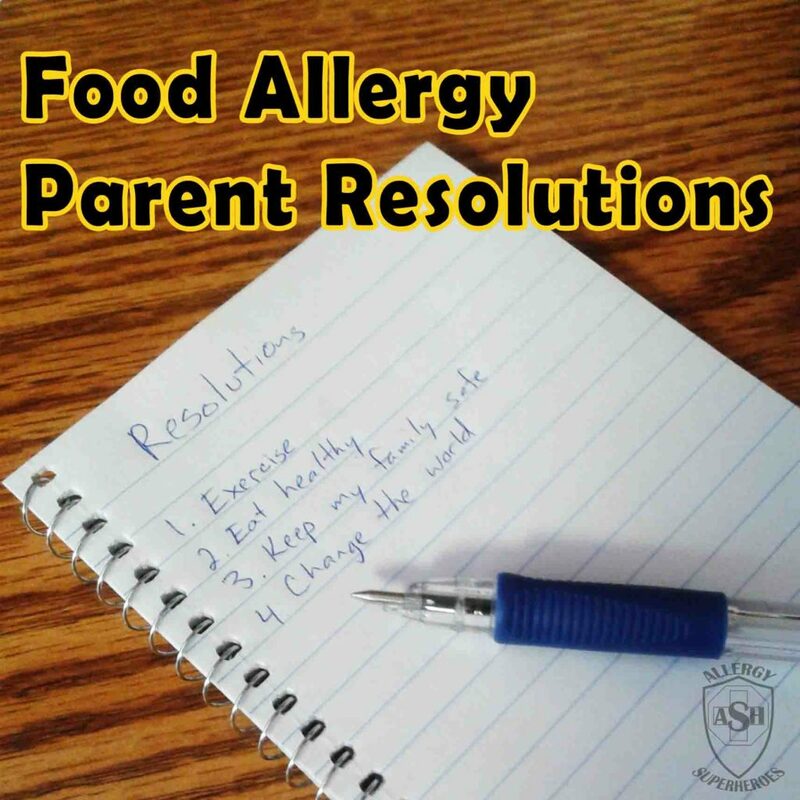 So today, I’m offering some Food Allergy Parent Resolutions that may help us improve the quality of our food allergy interactions in the coming year. Recognize that the people who don’t get it don’t have any reason to get it. Why would they? They’re not living this, so they’re not going to realize that this is worse than, say, hay fever. So remember to have patience with them. Think of yourself before you entered this world. Did you grumble if you heard a “please refrain from eating nuts” announcement on an airplane? Did you complain that peanut butter was the only lunch your child would eat (or yourself)? Did you balk at the thought of a food-free birthday celebration and declare that withholding cupcakes would ruin childhood? Even if you didn’t, did you understand the scope and severity of food allergies? So, start with the basics and go slow–and try to avoid making logic leaps or you may frustrate and lose them. Choose your words carefully. Words can attack or soothe, include or exclude, make people feel good or bad. Avoid any words that will make people stop listening. Saying “I don’t care what the kids think, you can’t have that food in the classroom” will meet with resistance. Saying “that treat could hurt my child, and will make him feel nervous and left out. Can we work together to find a celebration that will be fun for everyone?” will be received much more openly. I know I’m far more articulate with the written word than in person, so it can help to have some ready responses. Don’t expect others to understand cross contamination. Certainly not at the factory level. While it’s reasonable to ask people not to bring community foods to the classroom/your house that have “may contain” warnings, those warnings are voluntary and do not appear on all potentially contaminated foods. It’s too much to expect lay people to call on every product they want to bring to a classroom party–and they wouldn’t know how to draw out the information anyway. Instead, consider making sure your child has a safe stash, or provide the classroom parents/your family with a list of treats that you approve. Stop being afraid of cross contamination FROM cross contamination. If your child is anaphylactic to almonds, you may not want them eating a plain Hershey chocolate bar with a “may contain almonds” statement. But if other children are eating those same plain Hershey bars for their lunch, the chances of them having enough almond residue on their hands to elicit a reaction in your child is so slim that it really isn’t worth stressing over it. Really. Check in with your child. When our kids are little, we have to do a lot for them, and protecting their feelings so that they don’t feel left out is often part of the process. However as they get older, kids may start to get embarrassed by the stink their parents make over their allergies (especially if they have parents prone to making a stink a lot.) Your kids may genuinely prefer to go without a treat rather than witness you lecture their teacher one more time. Your gut reaction may be that it doesn’t matter if your kid gets embarrassed, the teacher ought to know by now that excluding a student isn’t okay–but ignoring your child’s preference here could be detrimental, long-term. After all, they are the one who will be leading this life forever, not you. They will take charge of managing their allergies someday, and part of that will be deciding when to raise their voice and when to just do without. If you raise your voice every time, even when your child has decided it isn’t a big deal, they may do a 180 and never raise their voice later, even when they ought to. You don’t want a negative emotional response associated with speaking up about their allergies. Stop bristling every time you hear the phrase “the world is not (allergen) free.” Bottom line, it’s not. You may be hearing this line from people who are choosing not to make an effort, and that’s frustrating, but consider whether it’s valid in the context (and how much danger it actually presents) before you fight back. As your child gets older they will need to navigate a world filled with their allergens–and they aren’t going to instinctively do that on their eighteenth birthday. They need practice leading up to that point, so as they grow, the bubble needs to be more flexible. Shake off setbacks (not reactions) and teach your kids to adopt this attitude as well. Just like you can’t remain upset for two hours about the driver who cut you off, you can’t obsess about every food allergy indignation indefinitely. To be happiest, you need to be able to roll with the punches. Because those punches will happen, and you (and your child) need to decide when those things aren’t worth bothering about and when they are. We’re all prone to get emotional when our kids safety and feelings are at stake, but keeping a level head can work wonders when dealing with the inevitable food allergy clashes. I wish you all a hopeful, happy, positive, inclusive, and reaction-free 2017!